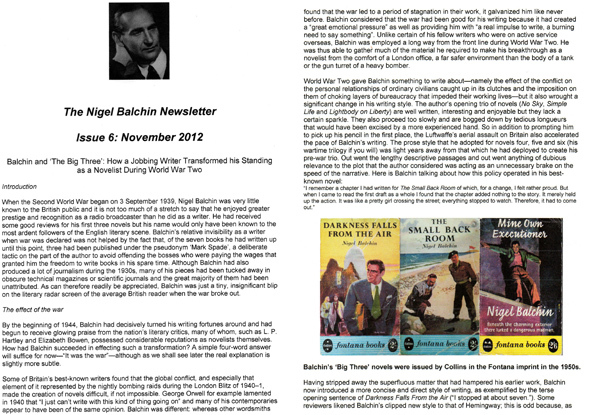 The Nigel Balchin Newsletter was launched in the summer of 2011 and offers subscribers the opportunity to pursue their interest in Balchin in a little more depth than can be achieved simply by browsing the website. Each issue contains a wealth of information about Balchin’s life and works, previous issues having included features such as a quiz, a writing competition and a guide to buying Balchin’s books. The Newsletter is free to subscribe to, contains no advertising and is provided as a service to all those enlightened people with an interest in Balchin. It is easy to subscribe to the Nigel Balchin Newsletter: just send an email to me, Derek Collett, using the form you will find on the ‘Contact’ page. I will then add you to the mailing list and you will receive the next issue as soon as it is ready (the two issues for 2016 are scheduled to be published in June and December). You can take a peek at previous issues by clicking on the links below. So for the inside track on everything to do with Nigel Balchin and the chance to receive information about him ahead of other visitors to this site, sign up today for the Nigel Balchin Newsletter! Subscribers’ email addresses will be stored on a computer and used in compliance with the 1998 UK Data Protection Act. These addresses will not be divulged to any third parties or used for any purpose other than to administer the Newsletter.